With the support of World Federation of Neurology I attended the Fifth Congress of the European Academy of Pediatric Societies Oct. 17-21 in Barcelona. The organizing societies were the European Academy of Pediatrics (EAP), The European Society of Pediatric and Neonatal Intensive Care (ESPNIC) and The European Society for Pediatric Research (ESPR). The excellent organization of the congress made it possible for pediatric professionals from around the world to gain unparalleled access to the best scientific research programs. The scientific program was varied. Abstract topics included: primary care and general pediatrics, neonatology, neonatal brain and development, neonatal pulmonology, neonatal cardiovascular, neonatal nutrition and gastroenterology, neonatal infection, adolescent health, pediatric surgery, cardiology and cardiac surgery, gastroenterology and hepatology/nutrition, neurology and developmental pediatrics, pulmonology/allergy/immunology/asthma, intensive care and pediatric emergency care medicine, hematology and oncology, nephrology, infectious diseases, endocrinology/diabetes/metabolism and pharmacology. I am grateful for the support of World Federation of Neurology that permitted me to attend this important congress and obtain experience that will help me in my work. 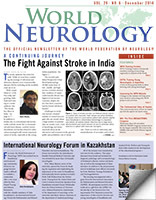 Gogatishvili is with the Institute of Neurology and Neuropsychology, Tbilisi, Tbilisi State Medical University, Tbilisi, Georgia.